مرتضایی, مهرزاد, خلفی, حمیدرضا, امیری امرائی, ایرج. (1393). مدلسازی درجه پخت در فرآیند ساخت پیش‌آغشته اپوکسی-شیشه. 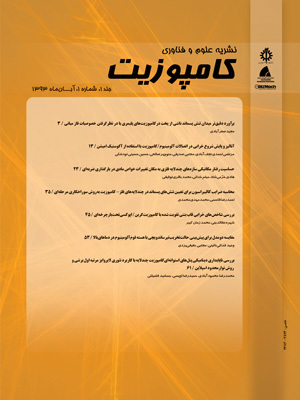 علوم و فناوری کامپوزیت, 1(2), 43-48. مهرزاد مرتضایی; حمیدرضا خلفی; ایرج امیری امرائی. "مدلسازی درجه پخت در فرآیند ساخت پیش‌آغشته اپوکسی-شیشه". علوم و فناوری کامپوزیت, 1, 2, 1393, 43-48. مرتضایی, مهرزاد, خلفی, حمیدرضا, امیری امرائی, ایرج. (1393). 'مدلسازی درجه پخت در فرآیند ساخت پیش‌آغشته اپوکسی-شیشه', علوم و فناوری کامپوزیت, 1(2), pp. 43-48. مرتضایی, مهرزاد, خلفی, حمیدرضا, امیری امرائی, ایرج. مدلسازی درجه پخت در فرآیند ساخت پیش‌آغشته اپوکسی-شیشه. علوم و فناوری کامپوزیت, 1393; 1(2): 43-48. درجه پخت پیش‌آغشته، یکی از مهم‌ترین مشخصه‌های آن به‌شمار می‌رود، به‌طوری‌که با تغییر در آن مشخصه‌های دیگر پیش‌آغشته مانند چسبناکی و جریان‌پذیری نیز تغییر می‌کند. برای کنترل و پیش‌بینی درجه پخت باید ارتباط کمی آن با پارامترهای فرآیندی مانند سرعت خط تولید پیش‌آغشته، دمای آون و میزان رزین تعیین شود. در این مقاله معادله انتقال حرارت حاکم بر سیستم پخت پیش‌آغشته اپوکسی- شیشه هم‌زمان با معادله سرعت پخت رزین اپوکسی، به‌روش عددی و به‌کمک برنامه رایانه‌ای نوشته شده در محیط نرم افزار میپل حل شد. همچنین پارامترهای سینتیک پخت رزین با استفاده از اطلاعات آزمون گرماسنجی پویشی تفاضلی هم‌دما به‌دست آمده است. نتایج به‌دست آمده نشان می‌دهد که هر چه میزان رزین پیش‌آغشته بیشتر باشد، در ابتدا دما و درجه پخت کمتر خواهد بود اما با آزاد شدن گرمای واکنش پخت، سرعت تغییرات دما و درجه پخت افزایش می‌یابد. همچنین نوع الیاف نیز بر درجه پخت پیش‌آغشته اثر گذار است به‌طوری‌که هر چه الیاف مورد استفاده چگالی و ظرفیت گرمایی ویژه بالاتری داشته باشد، دما و درجه پخت پیش‌آغشته کمتر خواهد بود. همان‌طور که انتظار می رفت با افزایش دمای آون، درجه حرارت پیش‌آغشته افزایش یافته و به‌طبع آن درجه پخت نیز افزایش خواهد یافت، درحالی‌که با افزایش سرعت خط تولید پیش‌آغشته، دما و درجه پخت پیش‌آغشته کاهش می‌یابد. Degree of cure is one of the most important properties of prepregs, so that the change in degree of cure will cause the changing the of other properties such as, mechanical properties, tack and resin flow. In order to predict and monitor degree of cure, the quantitative relation with processing parameters such as line speed, oven temperature and resin content have to be determined. In this paper, the heat transfer equation governing epoxy-glass prepreg curing systems, together with the equation for the rate of epoxy resin curing is solved using numerical methods and computer programs written in the MAPLE software. The kinetic parameters of the curing reaction of epoxy resin are also evaluated by using isothermal differential scanning calorimetry data. According to results, initially, the temperature and the degree of cure will be reduced by increasing the amount of resin. However, releasing of the heat of curing increases both the temperature variation rate and the degree of curing. Moreover, the fiber types affect the degree of curing; the higher the density and specific heat capacity of the fibers, the less the temperature and degree of curing. Finally, increasing the oven temperature raised the temperature and degree of cure, as expected. On the other hand, increasing the line speed decreased the temperature and the degree of cure. Mazumdar, S. K., “Composites manufacturing : materials, product, and process engineering”, pp. 58-59, USA :CRC Press LLC, 2000. Vafayan, M. Beheshty, M. H. Ghoreishy, M. H. R. Abedini, H., “Advanced integral isoconversional analysis for evaluating and predicting the kinetic parameters of the curing reaction of epoxy prepreg”, Thermochimica Acta, Vol. 557, pp. 37-43, 2013. Hayes, B. S. Seferis, J. C., “Simulation Engineering of Polymeric Prepreg Composite Systems”, PhD Thesis, University of Washington, Washington, 1997. Shaghaghi, S. Beheshty, M. H. Rahimi, H., “Preparation and Rheological Characterization of Phenolic/Glass Prepregs”, Iran Polymer Journal, Vol. 20, No. 12, pp. 969-977, 2011. Jubslip, C. Punson, K. Takeichi, T. Rimdusit, S., “Curing Kinetics of Benzoxazine- Epoxy Copolymer Investigated by non-Isothermal Differential Scanning Calorimetry”, Polymer Degradation and Stability, Vol. 95, pp. 918-924, 2010. Sun, L. Pang, S. Sterling, A. M. Negulescu, I. I. Stubblefield, M. A., “Dynamic Modeling of Curing Process of Epoxy Prepreg”, Journal of applied polymer science, Vol. 86, pp. 1911-1923, 2002. Hayaty, M. Beheshty, M. H. Esfandeh, M., “Cure Kinetics of a Glass/Epoxy Prepreg by Dynamic Differential Scanning Calorimetry”, Journal of applied polymer science, Vol. 120, pp. 62-69, 2011. Sabzevari, S. M. Alavi-Soltani, S. Minaie, B., “New Method for Estimating the Extent of Curing of Thermosetting Prepregs”, Journal of applied polymer science, Vol. 121, pp. 883-891, 2011. Wang, Q. Storm, B. K. Houmoller, L. P., “Study of the Isothermal Curing of an Epoxy Prepreg by Near-Infrared Spectroscopy”, Journal of applied polymer science, Vol. 87, pp. 2295-2305, 2003. Zhang, J. Xu, Y.C. Huang, P., “Effect of Cure Cycle on Curing Process and Hardness for Epoxy Resin”, Express Polymer Letters, Vol. 3, No. 9, pp. 534-541, 2009. Blest, D. C. Duffy, B. R. Mckee, S. Zulkifle, A. K., “Curing Simulation of Thermoset Composites”, Composite: Part A, Vol. 30, pp. 1289-1309, 1999. Loos, A. C. Springer, G. S., “Curing of Epoxy Matrix Composites, Composite Materials”, Vol. 17, pp. 135-169, 1983. Behzad, T. Sain, M. “Finite Element Modeling of Polymer Curing in Natural Fiber Reinforced Composites”, Composites Science and Technology, Vol. 67, pp. 1666-1673, 2007. Atarsia, A. Boukhili, R., “Relationship Between Isothermal and Dynamic Cure of Thermosets Via the Isoconversion Represention”, polymer Engineering and Sience, Vol. 40, No. 3, pp. 607-620, 2000. Kamal, M. R. Sourour, S., “Kinetics and thermal characterization of thermoset cure”, polymer Engineering and Sience, Vol. 13, pp. 59-64, 1973. Kamal, M. R. Sourour, S., “Differential Scanning Calorimetry of Epoxy Cure: Isothermal Cure Kinetics”, Thermochimica Acta, Vol. 14, pp. 41-59, 1976. Lam, P. W. K. Plaumann, H. P. Tran, T., “An Improved Kinetic Model for the Autocatalytic Curing of Styrene-Based Thermoset Resins”, Journal of applied polymer science, Vol. 41, pp. 3043-3057, 1990. Thecnical data sheet-Epon828, http://www.Momentive.com, available in September 2005. Krug, D. J. Asuncion, M. Z. Popova, V. Laine, R. M., “Transparent Fiber Glass Reinforced Composites”, Composites Science and Technology, Vol. 77, pp. 95-100, 2013. Bitzer, T., “Honeycomb technology—materials, design, manufacturing, applications and testing”, pp. 86, London: Chapman and Hall, 1997. Ahn, K. J. Seferis, J. C., “Prepreg Process Analysis”, Polymer Composite, Vol. 14, No. 4, pp. 349-360, 1993.